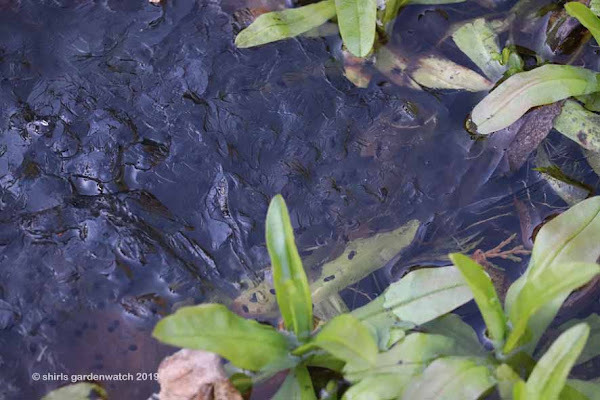 Early morning frost leaves ice along the pond edge where the frogspawn sits. 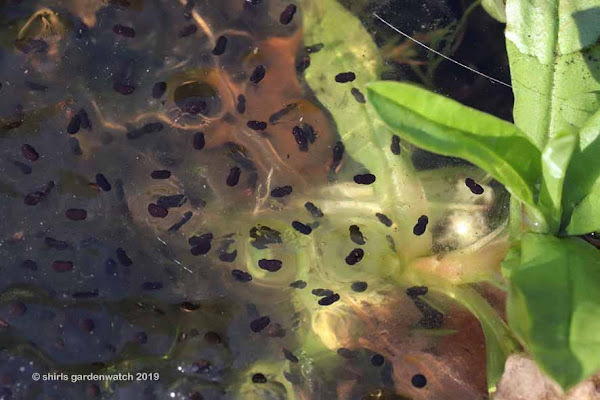 Mid-morning sun melts ice and the frog's eggs look like they are developing. Across from the frogspawn, is this a new pond creature with an orange patch? a greater water boatman/backswimmer has a hold of a ladybird! Snapping a few zoom shots, cropped here, clearly revealed a ladybird had been caught and was being held by a boatman and it was still moving! 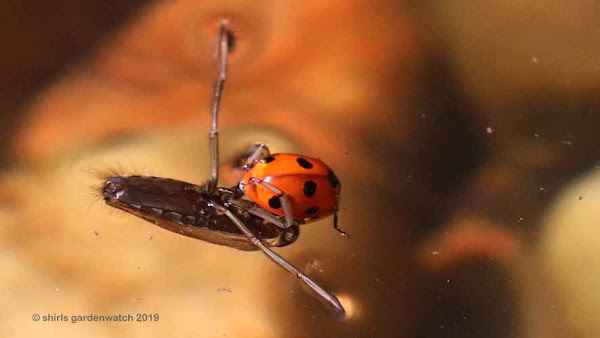 The boatman and the ladybird slowly spun around the surface of the water. Did the boatman get bored? Did it get disturbed by my camera clicking? Whatever the reason, the ladybird was left floating on the water surface. 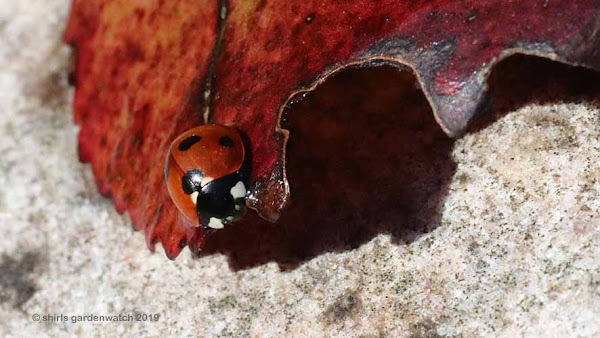 I picked off a pond edge bergenia leaf and scooped the ladybird out. It remained still for a bit looking like it had never been near water at all. Slowly the ladybird began moving, it turned around and headed up over the leaf. This cropped image shows how soggy it still was. Was it going to survive? 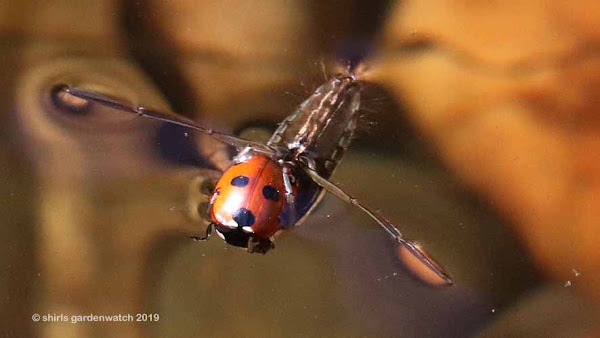 I have no idea, but this seven-spot ladybird knew where it was heading now. Had my camera lens just discovered it, I would have had no idea of the drama. 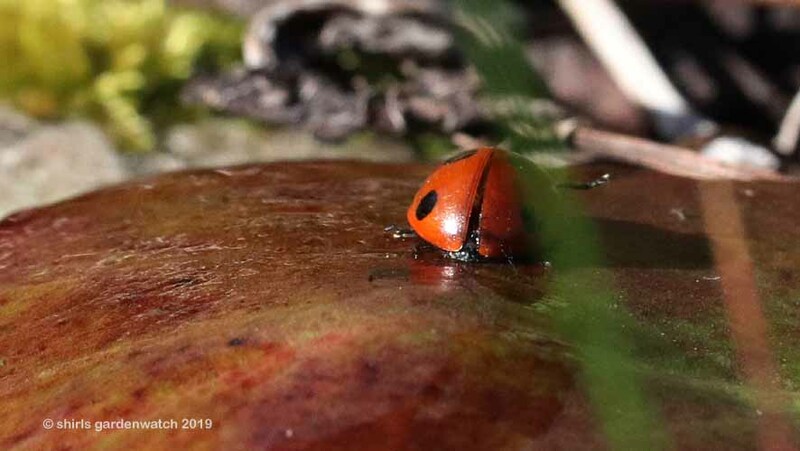 This ladybird looks completely well and at home in it's environment. 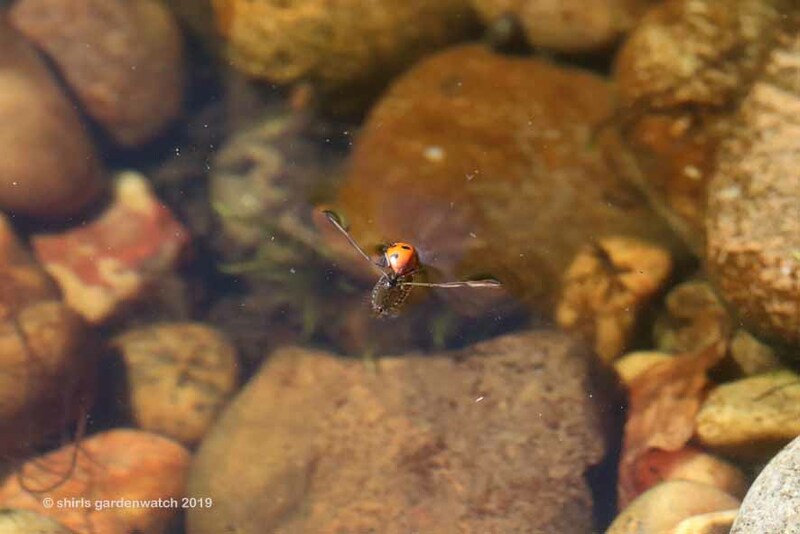 Below is some info on the water boatman. I have also read that where the greater boatman is carnivorous the lesser boatman is smaller and isn't, nor does it swim on its back. 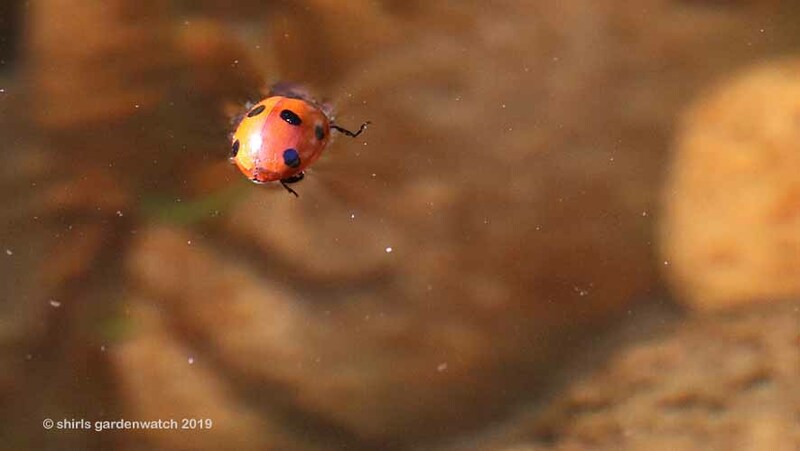 My guess is that our ladybird had wandered on to a sunny, pond edge pebble or rock where a boatman/backswimmer was and that's where it got caught. I hope it had a happy ending. This post was published by Shirley for shirls gardenwatch in April 2019. 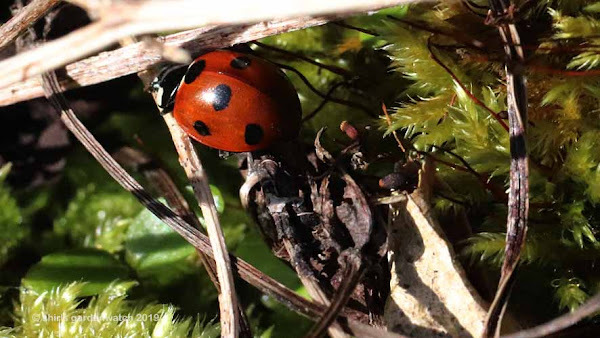 Thank you for saving the ladybird ! And thank you for your BBC stone skimming recommendation , my husband and I loved it . That was fascinating. Well done for capturing some great shots. I’m glad that the ladybird survived those seven spots need all the help they can get. You often see far more through the lens of a camera especially when zooming. You so often find the most interesting things in your garden. AND you get pictures. Well done! So glad that you were able to rescue the ladybird Shirl :) I hope that it recovered to tell the tale. Definitely, just spotted something crawling over a cone flower pic back in 2017 and wondering about ID now.